Through the DIY Stream, I met Emily. Emily has since then become a study buddy and life-long friend. DIY Diagnostics has given me so much more than a lab credit. My freshmen year at UT was a rough adjustment to college life. I had originally come from a high school where my graduating class was 43 students. Entering UT, especially the College of Natural Sciences, I felt like a small fish in a giant ocean of college students. When I visited the different research labs before deciding on a stream, I chose DIY as my first choice to visit. Upon entering the open house, the first words Dr. Tim Riedel said to us was, “I hope this lab is a home to you. 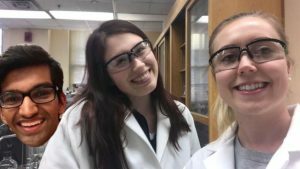 Yes, you’ll be doing research… but I hope this lab will be another home for you to come to.” I instantly fell in love with the thought of a home-away from home on campus. This FRI Stream gave me the opportunity to conduct research that many others wouldn’t be able to till grad school AND I was able to have a community on campus. 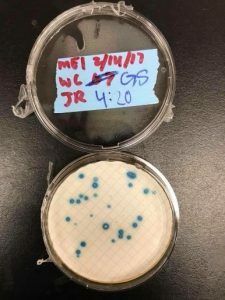 These two photos are pictures of the techniques to plate E. Coli collected from Waller Creek. This was the first time that research I conducted actually went to a project that is proposed to fix a problem in real-life! Now the FRI, it’s pretty unique in itself. When I first applied for the Freshmen Research Initiative, I had no idea what this organization actually was. Long story short, the FRI is the ability to conduct actual research as an undergraduate while getting lab credit for the research I am conducting. The DIY Diagnostics stream is exactly what you think, “Do-It-Yourself Diagnostics”! My mentors described our research with the example of a pregnancy test. You are “diagnosing” yourself with a tool created with research! 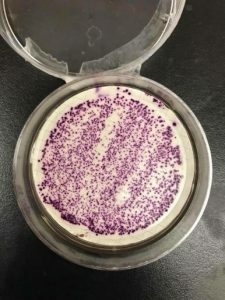 The first semester in DIY Diagnostics or the FRI is mostly a semester that allows students to learn researching techniques and develop a taste for research. Coming from a small school, this semester was crucial for me to learn information about lab techniques, rules, and knowledge. Your second semester (the one I am currently in) is when the fun begins! The second semester of participating in the Freshmen Research Initiative- DIY Diagnostics Stream is where you conduct your own research to ultimately create a DIY Diagnostic tool! Personally, I had a tough time deciding which diagnostic idea I wanted to join. I thought the DIY Zika test was super cool… but so was the Parkinson’s keystroke project, UV Wearable, and many others! I decided that the Parkinson’s keystroke project was one that I felt I could make a difference in. I am super excited for what this semester holds for the Parkinson’s Keystroke Research! 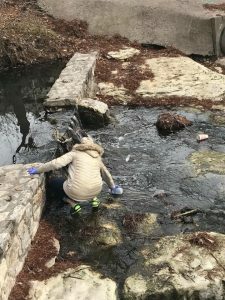 Here I am collecting water out of Waller Creek that was used to get the samples pictured above. Joining the DIY Diagnostics research team, I found a community and a home. What is super neat about joining an FRI stream, is that all the members in your stream are most likely taking the same or similar classes as you are. By meeting my fellow researchers, I met study buddies and friends. The FRI helped me succeed not only in research, but in my classes. Before joining DIY Diagnostics, I wasn’t sure if I would enjoy research or conducting experiments in a lab. But once you contribute to a research project that ACTUALLY contributes to solving a real-life problem, it excites you in a way you have never felt before! So I leave you with this advice… join the FRI, join DIY Diagnostics, find your lab coat and find your home.